Designed for on-the-go convenience, Conditioning Shampoo contains an advanced delivery system to effectively reinforce your hair’s essential need for cleansing, moisturizing, and nutrition. Conditioning Shampoo is formulated with unique and clinically-tested Triamino Copper Complex™. Providing an optimal environment for healthy growth and appearance, your hair and scalp will benefit from this unique combination of essential amino acids, minerals and body-building ingredients. Your scalp will feel enlivened, and your hair will feel thicker and fuller. Shampoo daily, massaging into moistened hair and scalp, leaving on for 3 to 5 minutes before rinsing. A second application may be made if desired with an application of Follicle Therapy Spray following shampooing and drying. Tricomin Deep Conditioning Treatment – Penetrating panthenol and retexturing silk amino acids are blended together to offer a deep conditioning treatment that revives damaged, over-processed or chemically treated hair. Essential moisture and healthy lustre is restored. Panthenol, with its proven superior ability to repair damaged hair, builds moisture and nutrients deep within individual strands. Silk amino acids protects the hair from water loss and leaves a soft, smooth texture. Hair looks and feels better immediately. Condition and treat your hair all day long with Follicle Therapy Spray. This exceptional leave-in spray can be used on wet or dry hair for anytime convenience. Follicle Therapy Spray enriches your scalp with clinically tested and proven Triamino Copper Complex™ plus a unique blend of essential amino acids, minerals and body-building agents. Using a unique moisture and nutrient-rich framework, Restructuring Conditioner helps restore your hair’s natural protein and mineral balance, building structure, luster, and body onto thinning, damaged and otherwise challenged hair. The nourishing formulation stimulates, invigorates, and conditions your hair while powering-up natural defense processes with the clinically-tested Triamino Copper Complex™. When used in combination with Revitalizing Shampoo, your hair and scalp will luxuriate in the optimal environment for healthy growth and appearance. Condition daily after shampooing, gently massaging into moistened hair and scalp, leaving in for 2 to 3 minutes before rinsing. Follow with Follicle Therapy Spray after drying. 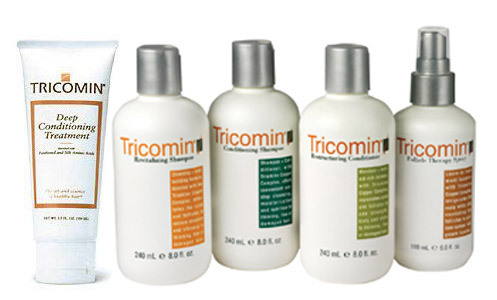 Stimulate and revive your hair’s health with Tricomin’s Revitalizing Shampoo, fortified with Triamino Copper Complex™. This luxurious shampoo combines a unique cleansing and body-building formulation to bathe your scalp with essential amino acids and minerals. Gentle enough to use every day, Revitalizing Shampoo restores structure and vitality to thinning, fine, or damaged hair. For best results, use with Restructuring Conditioner and Follicle Therapy Spray. Hair So Real is instant and looks natural. Neat and easy application, just sprinkle it on. 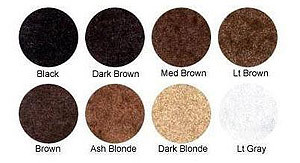 Thickens thinning hair. Stays on until you wash it out. Takes years off your appearance. Regain your confidence and spontaneity. Recommended substitute for Great Cover-UP Users!